Meet us at the Canyon Club! 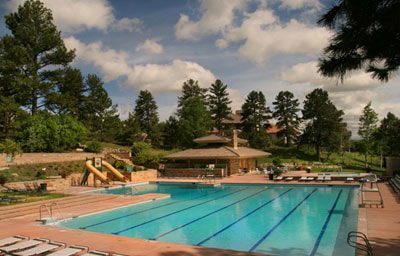 The Canyon Club is located on the South side of The Village at Castle Pines and is the perfect place to gather with friends, family, and neighbors under Rocky Mountain blue skies. Join in on the fun at the Canyon Club’s kiddie and Olympic-sized swimming pools. You can make it a full day in the sun and grill something up for the family on our Viking stainless-steel gas grills. Take the family to one of the five state-of-the-art tennis courts for mixed doubles, or prep for the tennis social on the tennis backboard. Try your hand at pickleball on one of the two sport courts, or meet neighbors for some pickup basketball. Invite friends to play in the sand and dig a spike on our sand volleyball court. Kids will enjoy the playground area with ample spots for picnicking or watch the kids soccer practice on the 60-yard playing field.